It's Wednesday again, and time for another GREAT challenge at Word Art Wednesday. This week we have an AMAZING combination of sponsors. They really are a WINNING COMBINATION! Our physical sponsor is the WONDERFUL Really Reasonable Ribbon, and our digital sponsor is the GORGEOUS My Artistic Adventures. I used items from BOTH of these awesome shops on my card for this week. First, you will notice my sentiment - this week's FREE scripture/word art file. 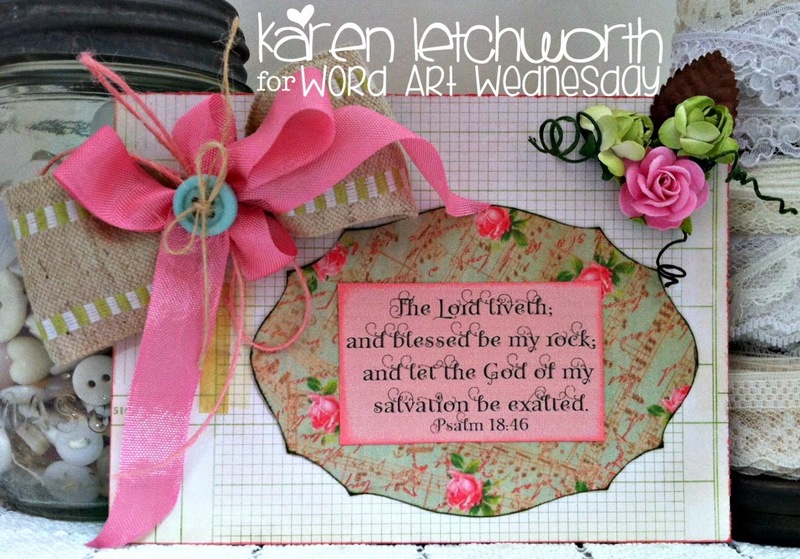 You can have this beautiful file for free by visiting the Word Art Wednesday Challenge Blog. You are never required to use it on your card in order to play along and be eligible for our amazing prizes; but it is there for you, nonetheless. 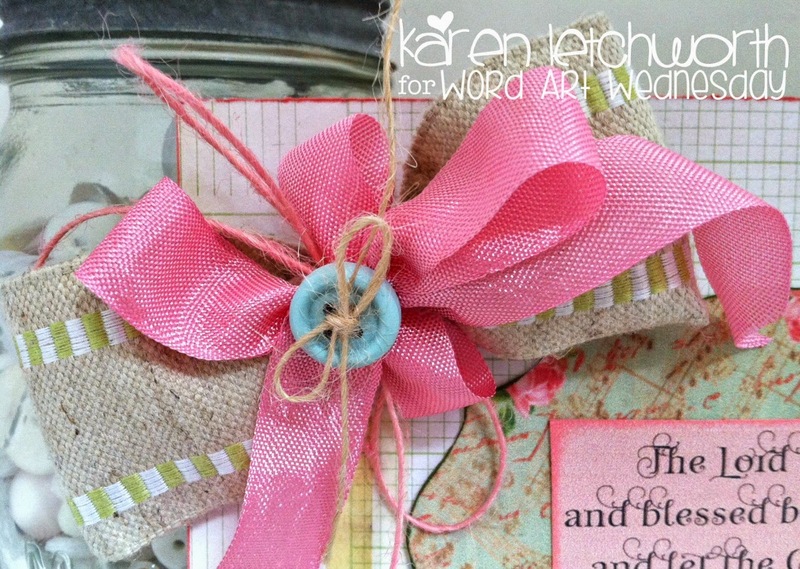 The scripture is printed on a colored background, and was placed on a digital tag from the Romantic Victorian Vintage Tags Set from My Artistic Adventures. Aren't they gorgeous? You will find so many lovely images in this sweet Etsy Shop. I hope you will take time to do some browsing. One lucky person will win some of these sweet images to enjoy, so be sure to link up in our challenge. I also used LOTS of great products from Really Reasonable Ribbon. Aren't those bows and ribbons lovely? I used their sweet Pink Burlap String, Pink Aster Seam Binding, the GORGEOUS Wide Natural Burlap With Parrot Green and White Striped Edge, Natural Burlap String, a Brown Paper Leaf, 20 mm Open Roses in Pink and Green Open Roses. It's true! Really Reasonable Ribbon not only carries the most lovely ribbons, laces and trims; but they also carry hair-bow accessories, crafty bags, flowers, and SO much more. One very lucky entrant will win a $15 Gift Certificate to Really Reasonable Ribbon. WOW! That's why I say "It's a Winning Combination" - Word Art Wednesday Challenge Blog where ANYTHING GOES (family friendly) and you can share up to 5 projects per week, Really Reasonable Ribbon where you can find the sweetest ribbons and craft supplies, and My Artistic Adventures where you can get the sweetest digital images to enhance your projects. What are you waiting for? Hop on over to Word Art Wednesday and play along with us. We LOVE having you share your talents with us, and YOU could be the lucky winner of one of these awesome prizes. Thanks so much for stopping by, and have a blessed week. Just Beautiful as always love the ribbons and embellishments . I like how you have combined the pinks and green.